I would like to thank Timmy Collins my roommate over the past 2 weeks and one of the most exciting and interesting pitchers I have ever seen and/or played with for putting me up last night and taking me to the airport today. Tim is rare, and will always be climbing uphill against the grain and fighting off critics, which he has done gracefully so far. The rosters say he's 5'7", but realistically he stands around 5'5" or 5'6" and a soaking wet 150 pounds, he is the 2nd smallest player in professional baseball, and he's a pitcher. Tim is a left-handed power pitcher at that, his straight over the top fastball sits between 91-94 MPH, and his strikeout pitch is a filthy curve ball. He uses everything he can in every pitch, a lot like a left handed Tim Lincecum. The interesting part is that he just turned 20 last week. His strikeout stats are ridiculous, and he had such a good year last year in single A as an 18 year old that he was named all of minor leagues 'Single A pitcher of the year'. Not bad, keep an eye on this kid... anyways, back to what popped in my head a little earlier to write about. Tim is second from the right, I'm in the back with most of the bullpen and some of our very loyal fans at the ballpark in Portland, Maine the last game of the season. On the way to my last bullpen session today in a city called Worcester (pronounced Wuss-ster) Massachusetts we stopped at a little place called Lango’s subs and pizza. Huge menu, and I had their fajita wrap which was delicious, but the thing that makes me want to write this blog was what I saw on their walls. Their owner seemed to be quite the world traveller, and had pictures of himself from all over the world in collages, and had them labeled. Timmy Collins has never been out of the states, and he thought this was the coolest thing ever. So I looked closer at some of his destinations, I realized had been to many of them, Paris, yep, Grand Canyon, yep, Barcelona, check... on and on. This spurred my blog-mind and made me want to boast/make people feel sorry for my travel schedule/let everyone know about the crazy world travels Shorty and I have encountered over the past few years. My wife whom on my blog I call by Shorty has quite a rare feat that she accomplished over the past 7 months. She has driven our little Civic Hybrid to all 4 corner states in the USA. In February we drove from Vancouver down to California and then across to Oklahoma. 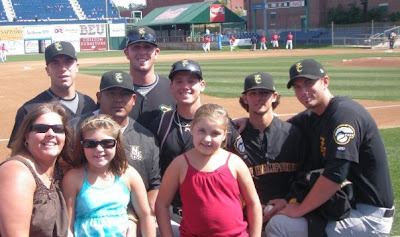 When I was assigned to the New Hampshire Fisher Cats Shorty made the 24 hour drive to join me up there, and at one point followed us on the road to Portland, Maine. A couple months later I had to head to south, down to Dunedin, Florida to pitch for the Dunedin Blue Jays. Shorty, the trooper she is, drove all the way down the east coast to complete her feat and have driven herself and our car to all 4 corner states of mainland USA. I may add more destinations to this list over the next few days as I think of them... We lead crazy lives. I have been living off the same clothes out of a carry-on and my big duffel bag over the past 8 months, it's not easy living out of a bag. Going from day to day, packing up your bag, making sure enough clothes are clean, folded (wrinkles are inevitable in this lifestyle) gets very old very quick. I am looking forward to being back at home so that I can unpack and live out of the same room for at least 3 months. I live an amazing life, this is just one of the overlooked 'you gotta deal with it' parts of this lifestyle, and I'm fine with that as long as I can keep playing baseball and getting better and better at my craft. We love the picture of your loyal fans, they must really like the bullpen. =) The girls are having a bit of withdrawls from bullpen visits and their favorites, but it's great to come on here and read what you've been up to. Enjoy your time with Jeana and time off from ball.